1) Our stay at the Queen's St. Hilton for the first few weeks, right smack in the middle of everything. 2) Later, the terrace / extended kitchen of our New Farm apartment, which overlooked the Brizzy skyline and river. 3) Learning to play tennis at New Farm Park, walking to local restaurants, and weekends at the nearby Powerhouse Market. 5) Viewing the city from Mount Coot-tha, and hiking the trails to nearby waterfalls. 6) The Whale-Watching boat tour -- our boat departed from Moreton Bay. We got so close, it seemed we could almost touch these boat-sized beasts! 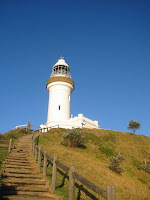 6) Byron Bay Lighthouse (whence the name Lukas "Byron" Kraft). If you're in the area, this is a must-see. Walk up there from the sleepy village of Byron Bay. It's an incredible hike!!! Adventure seekers, try hang-gliding above the bay from the cliffs near the lighthouse. 7) The Lamington & Springbrook Rainforests, and 4-wheeling up there. 9) Noosa Heads - Especially the Noosa National Park. Hike along the cliffs to the secluded beach for some truly incredible photos. Keep an eye out for koalas! Also fun: learning to surf at the Noosa surf school. 10) Sunshine Coast Hinterland, with it's eerie volcano-shaped mountains. The towns nestled in the Glass House Mountains are wonderful. My favorites: Eumundi (with its Wednesday and Saturday markets), Montville, and Maleny. Another must-see: The Australia Zoo, made famous by the iconic Steve Irwin (aka the "Crocodile Hunter"). 11) Carnarvon Gorge. We hiked for 20 kilmoters through this incredible gorge, then camped out nearby and watched the kangaroos bounce past at dusk. 14) The Blue Mountains and "Three Sisters" rock formation. A few-hours' drive from Sydney, and well worth it! 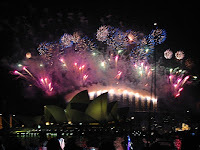 15) Melbourne, the Dandenongs, and the Great Ocean Road. 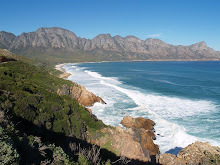 Okay, so there aren't exactly "12 Apostles" anymore, but those that remain are still worth seeing! 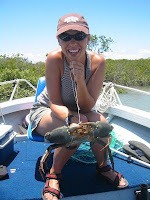 17) Reef-fishing on the Great Barrier Reef, mudcrabbing in the Gladstone-area mangroves, snorkeling the reef. And voila! Our favorite Australia sites, in a nutshell. And now, I'm off to plan next week's trip... with children. Stay posted for more photos of our past, and upcoming trips to magical Oz.